Central banks around the globe are choking on low-yielding bonds, and as result are now expanding their investment menu beyond Treasuries into equities. Expansionary monetary policies purchasing short-term, low-rate bonds means that central banks have been gobbling up securities on their balance sheets that are earning next to nothing. To counteract the bond-induced indigestion of the central banks, many of them are considering increasing their equity purchasing strategies. How can you blame them? With the 10-year U.S. Treasury notes yielding 1.66%; 10-year German bonds eking out 1.21%; and 10-year Japanese Government Bonds (JGBs) paying a paltry 0.59%, it’s no wonder central banks are looking for better alternatives. More specifically, the Bank of Japan (BOJ) is planning to pump $1.4 trillion into its economy over the next two years to encourage some inflation through open-ended asset purchases. Earlier this month, the BOJ said it has a goal of more than doubling equity related exchange traded funds (ETFs) by the end of 2014. According to Business Insider, the BOJ is currently holding $14.1 billion in equity ETFs with an objective to reach $35.3 billion in 2014. I can only imagine how stock market bears feel about this developing trend when they have already blamed central banks’ quantitative easing initiatives as the artificial support mechanism for stock prices (see also The Central Bank Dog Ate my Homework). How big is this shift towards equities? The Royal Bank of Scotland conducted a survey of 60 central banks that have about $6.7 trillion in reserves. There were 13% of the central banks already invested in equities, and almost 25% of them said they are or will be invested in equities within the next five years. While I may agree that stocks generally are a more attractive asset class than bubblicious bonds right now, I may draw the line once the Fed starts buying houses, gasoline, and groceries for all Americans. Until then, dividend yields remain higher than Treasury yields, and the earnings yields (earnings/price) on stocks will remain more attractive than bond yields. Once stocks gain more in price and/or bonds sell off significantly, it will be a more appropriate time to reassess the investment opportunity set. A further stock rise or bond selloff are both possible scenarios, but until then, central banks will continue to look to place its money where it is treated best. 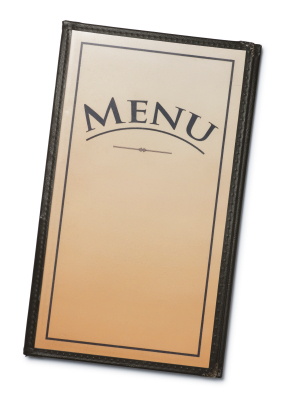 The central bank menu has been largely limited to low-yielding, overpriced government bonds, but the appetite for new menu items has heightened. Stocks may be an enticing new option for central banks, but let’s hope they delay buying houses, gasoline, and groceries. HJ Heinz Company (HNZ – $27.4 billion) – February 14, 2013 – Bidder: Berkshire Hathaway (BRKA)/ 3G Capital Partners. Virgin Media Inc. (VMED – $21.9 billion) – February 6, 2013 – Bidder: Liberty Global Inc. (LBTYA). Dell Inc. (DELL – $21.8 billion) – February 5, 2013 – Bidder: Silver Lake Partners LP, Michael Dell, Carl Icahn. NBCUniversal Media LLC 49% Stake (GE- $17.6 billion) – February 12, 2013 – Bidder: Comcast Corp. (CMCSA). These elephant deals helped the overall M&A deal values in the United States increase by +34% in Q1 from a year ago to $167 billion (see Mergermarket report). Unfortunately, the picture doesn’t look so good on a global basis. 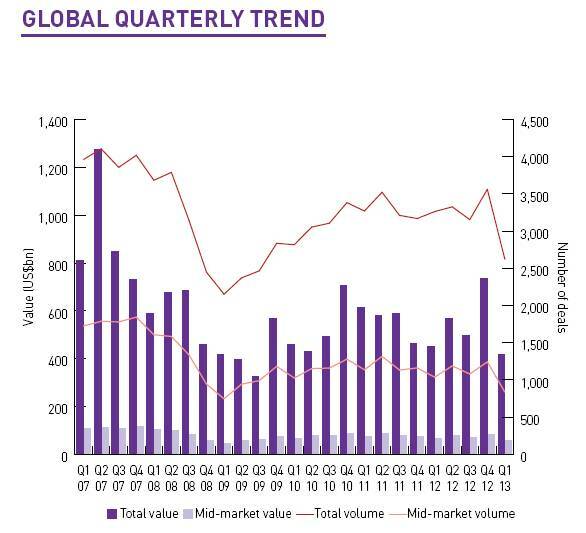 The overall value for global M&A deals in Q1 registered $418 billion, down -7% from the first quarter of 2012. On a transaction basis, there were a total of 2,621 deals during the first three months of the year, down -20% from 3,262 deals in the comparable period last year. With central banks across the globe pumping liquidity into the financial system and the U.S. stock market near record highs, one would think buyers would be writing big M&A checks as they wrote poems about rainbows, puppy dogs, and flowers. This is obviously not the case, so why such the sour mood? The biggest scapegoat right now is Europe. While the U.S. economy appears to be slowly-but-surely plodding along on its economic recovery, Europe continues to dig a deeper recessionary hole. Austerity-driven fiscal policies are hindering growth, and concerns surrounding a Cypriot contagion continue to grab headlines. Although the U.S. dollar value of deals was up substantially in Q1, the number of transactions was down significantly to 703 deals from 925 in Q1-2012 (-24%). Besides buyer nervousness, unfriendly tax policy could have accelerated deals into 2012, and stole business from 2013. Besides lackluster global M&A volume, the record low EBITDA multiples on private equity exit prices is proof that skepticism on the sustainability of the economic recovery remains uninspired. 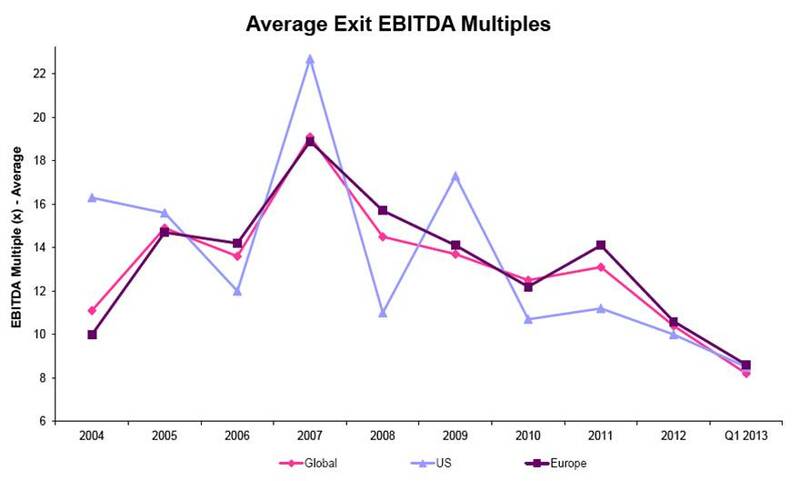 With exit multiples at a meager level of 8.2x globally, many investors are holding onto their companies longer than they would like. While merger activity has been a mixed bag, a bright spot in the M&A world has been the action in emerging markets. In 2012, the value of global transactions was essentially flat, yet emerging market deal values were up approximately +9% to $524 billion. This value exceeded the pre-crisis M&A activity level in 2007 by $73 billion, a feat not achieved in the other regions around the globe. Although emerging markets also pulled back in Q1, this region now account for 23% of total global M&A deal values. Elephant buyout deals in the private equity space (skewed heavily by the Heinz & Dell deals) caused results to surge in this segment during the first quarter. 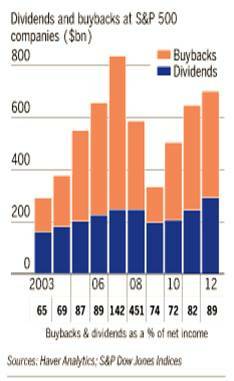 Private equity related buyouts accounted for the highest share of global M&A activity (~21%) since 2007. However, like the overall U.S. M&A market, the number of Q1 transactions in the buyout space (372 transactions) declined to the lowest count in about four years. 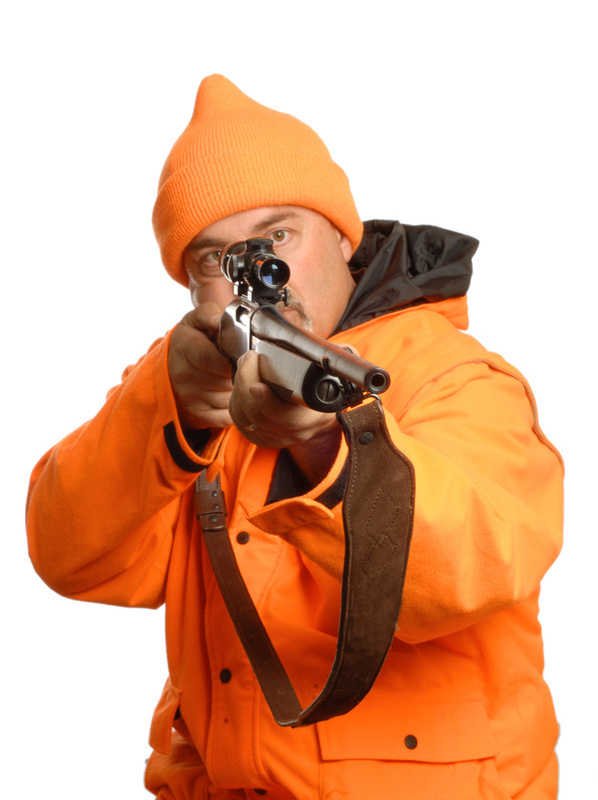 Despite the weak overall M&A activity, the hunters are out there and they have plenty of ammunition (cash). DISCLOSURE: Sidoxia Capital Management (SCM) and some of its clients hold positions in certain exchange traded funds (ETFs) and CMCSA, but at the time of publishing SCM had no direct position in HNZ, BRKA, VMED, LBTYA, DELL, GE, DISH, S or any other security referenced in this article. No information accessed through the Investing Caffeine (IC) website constitutes investment, financial, legal, tax or other advice nor is to be relied on in making an investment or other decision. Please read disclosure language on IC Contact page. It’s been a painful four years for the bears, including Peter Schiff, Nouriel Roubini, John Mauldin, Jimmy Rogers, and let’s not forget David Rosenberg, among others. Rosenberg was recently on CNBC attempting to clarify his evolving bearish view by explaining how central banks around the globe have eaten his forecasting homework. In other words, Ben Bernanke is getting blamed for launching the stock market into the stratosphere thanks to his quantitative easing magic. According to Rosenberg, and the other world-enders, death and destruction would have prevailed without all the money printing. Rosenberg isn’t the only bear blaming central banks for the unexpected rise in equity markets. As mentioned previously, fear and panic have virtually disappeared, but these emotions have matured into skepticism. Record profits, cash balances, and attractive valuations are dismissed as artificial byproducts of a Fed’s monetary Ponzi Scheme. The fact that Japan and other central banks are following Ben Bernanke’s money printing lead only serves to add more fuel to the bears’ proverbial fire. Speculative bubbles are not easy to identify before-the-fact, however they typically involve a combination of excessive valuations and/or massive amounts of leverage. In hindsight we experienced these dynamics in the technology collapse of the late-1990s (tech companies traded at over 100x’s earnings) and the leverage-induced housing crisis of the mid-2000s ($100s of billions used to speculate on subprime mortgages and real estate). I’m OK with the argument that there are trillions of dollars being used for speculative buying, but if I understand correctly, the trillions of dollars in global liquidity being injected by central banks across the world is not being used to buy securities in the stock market? Rather, all the artificial, pending-bubble discussions should migrate to the bond market…not the stock market. All credit markets, to some degree, are tied to the trillions of Treasuries and mortgage-backed securities purchased by central banks, yet many pundits (i.e., see El-Erian & Bill Gross) choose to focus on claims of speculative buying in stocks, and not bonds. While bears point to the Shiller 10 Price-Earnings ratio as evidence of a richly priced stock market, more objective measurements through FactSet (below 10-year average) and Wall Street Journal indicate a forward P/E of around 14. A reasonable figure if you consider the multiples were twice as high in 2000, and interest rates are at a generational low (see also Shiller P/E critique). The news hasn’t been great, volatility measurements (i.e., VIX) have been signaling complacency, and every man, woman, and child has been waiting for a “pullback” – myself included. The pace of the upward advance we have experienced over the last six months is not sustainable, but when we finally get a price retreat, do not listen to the bears like Rosenberg. Their credibility has been shot, ever since the central bank dog ate their homework. DISCLOSURE: Sidoxia Capital Management (SCM) and some of its clients hold positions in certain exchange traded funds (ETFs) , but at the time of publishing SCM had no direct position in any other security referenced in this article. No information accessed through the Investing Caffeine (IC) website constitutes investment, financial, legal, tax or other advice nor is to be relied on in making an investment or other decision. Please read disclosure language on IC Contact page. But wait. Going from one banking stock to 20 banking stocks is not going to provide you with the proper diversification you want or need. Rather, what is as important as investing across asset class, geography, style, and size, is to follow the individual stock strategies of guru Peter Lynch. In order to put his performance into perspective, Lynch’s Fidelity Magellan fund averaged +29% per year from 1977 – 1990 – almost doubling the return of the S&P 500 index for that period. Stalwarts: These are large established companies that still have the ability to achieve +10% to +12% annual earnings growth regardless of the economic cycle. Lynch liked these stocks especially during recessions and downturns. Valuations are still very important for Stalwarts, and many of them pay dividends. An investor may not realize a “home run” with respect to returns, but a +30% to 50% return over a few years is not out of the question, if selected correctly. Former examples of “Stalwarts” include Coca Cola (KO) and Procter & Gamble (PG). Fast Growers: This categorization applies to small aggressive firms averaging about +20% to +25% annual earnings growth. While “Fast Growers” offer the most price appreciation potential, these stocks also offer the most risk, especially once growth/momentum slows. If timed correctly, as Lynch adeptly achieved, these stocks can increase multi-fold in value. The great thing about these “Fast Growers” is they don’t have to reside in fast growth industries. Lynch actually preferred market share gainers in legacy industries. Cyclicals: These companies tend to see their sales and profits rise and fall with the overall economic cycle. The hyper-sensitivity to economic fluctuations makes the timing on these stocks extremely tricky, leading to losses and tears – especially if you get in too late or get out too late. To emphasize his point, Lynch states, “Cyclicals are like blackjack: stay in the game too long and it’s bound to take all your profit.” The other mistake inexperienced investors make is mistaking a “Cyclical” company as a “Stalwart” at the peak of a cycle. Examples of cyclical industries include airline, auto, steel, travel, and chemical industries. Turnarounds: Lynch calls these stocks, “No Growers,” and they primarily of consist of situations like bail-outs, spin-offs, and restructurings. Unlike cyclical stocks, “Turnarounds” are usually least sensitive to the overall market. Even though these stocks are beaten down or depressed, they are enormously risky. 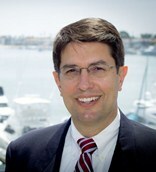 Chyrysler, during the 1980s, was an example of a favorable Lynch turnaround. Asset Plays: Overlooked or underappreciated assets such as real estate, oil reserves, patented drugs, and/or cash on the balance sheet are all examples of “Asset Plays” that Lynch would consider. Patience is paramount with these types of investments because it may take considerable time for the market to recognize such concealed assets. Worth noting is that not all stocks remain in the same Lynch category. Apple Inc. (AAPL) is an example of a “Fast Grower” that has migrated to “Stalwart” or “Slow Grower” status, therefore items such as valuation and capital deployment (dividends and share buyback) become more important. Peter Lynch’s heroic track record speaks for itself. 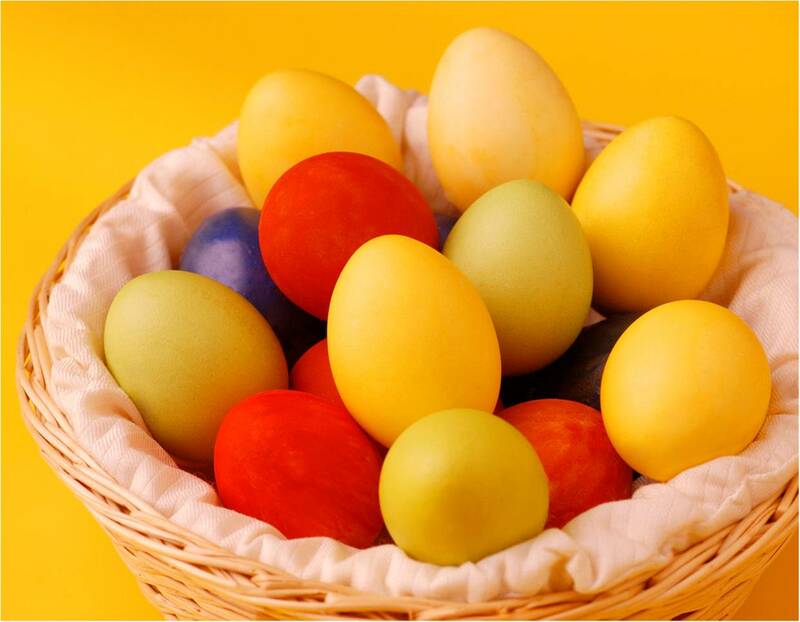 Traditional diversification methods of spreading your eggs across various asset class baskets is useful, but this approach can be enhanced by identifying worthy candidates across Lynch’s six specific stock categories. Hunting for these winners is something Lynch and the Easter bunny could both agree upon. DISCLOSURE: Sidoxia Capital Management (SCM) and some of its clients hold positions in certain exchange traded funds (ETFs) and AAPL, but at the time of publishing SCM had no direct position in KO, PG, Chrysler, Fidelity Magellan, or any other security referenced in this article. No information accessed through the Investing Caffeine (IC) website constitutes investment, financial, legal, tax or other advice nor is to be relied on in making an investment or other decision. Please read disclosure language on IC Contact page. Stock Market at Record Highs…April Fool’s? Article is an excerpt from previously released Sidoxia Capital Management’s complementary April 1, 2013 newsletter. Subscribe on right side of page. 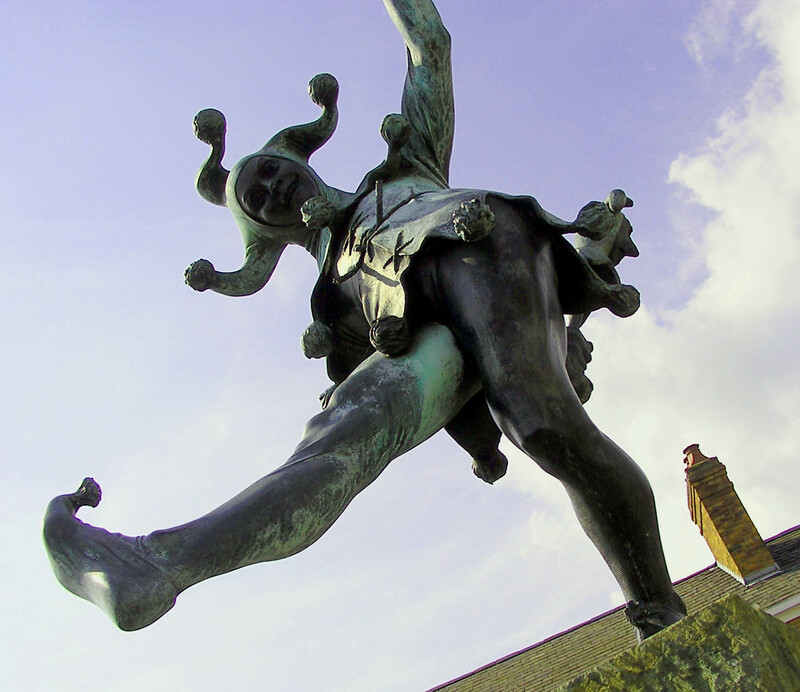 April Fool’s Day has been around for centuries and has provided an opportunity for foolish pranks to be played on the masses around the world. Evidence of the global practice can be found from the bumper spaghetti harvest in Switzerland filmed by the BBC in 1957. The video footage (click here) was so convincing, viewers called and asked how they could grow their own spaghetti. 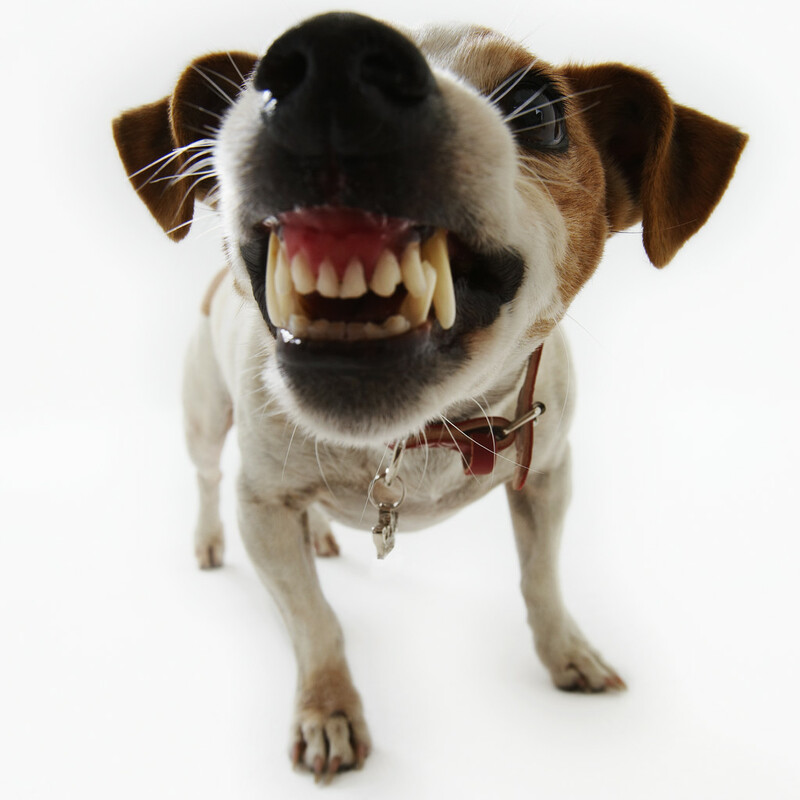 A cruel prank has also been played on investing skeptics as they have watched the S&P 500 and Dow Jones Industrials indexes catapult to new record highs over the last five quarters (up +25% & +19%, respectively). How can the stock market be setting new records when we have recently experienced a fiscal cliff, sequestration, a deepening European recession, slowing corporate profit growth, anemic GDP (Gross Domestic Product) expansion (0.4% last quarter), and a $13 billion Cyprus bailout? The short answer is the economy continues to improve at a steady pace; stock prices are attractive; and gloomy headlines sell more advertisements in newspapers, magazines and on television. Is this wealth explosion a practical joke, or how can we help better explain this surprising phenomenon? 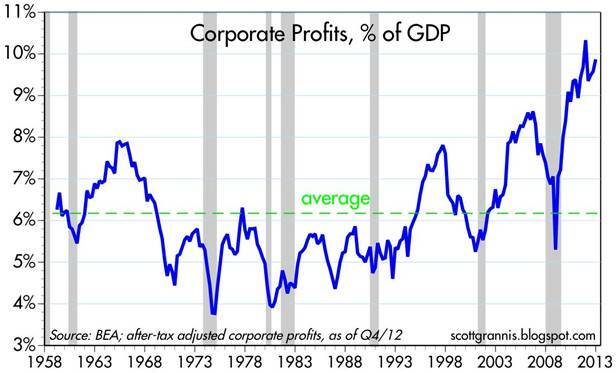 Corporate profits are at record levels. After the worst financial crisis in a generation, companies have become mean and lean. They are hiring cautiously to maintain healthy profit margins, but also investing into productivity-improving technology and equipment. Annual dividend payments have reached a record level of more than $300 billion for S&P 500 companies, and there are no signs of this trend slowing down. 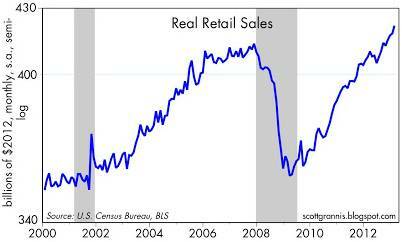 This is occurring just as interest rates on bonds have been continuing to decline. Tack on a few hundred billion dollars in share buybacks to boost stock prices, and you get a recipe investors are enjoying. 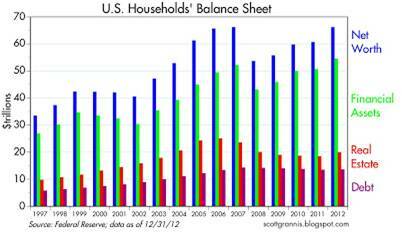 Housing accounts for a significant portion of our economy. After several years of depression-like activity, this sector is on the comeback trail. 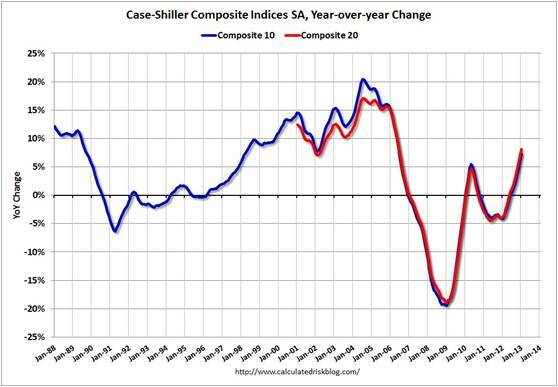 In fact, the S&P/Case-Shiller index, that measures home prices in 20 major metropolitan cities, rose by +8.1% in the most recent reported figure. This increase was the largest gain in six-and-a-half years. This is important because the improvement in housing filters through to other major sectors of the economy, such as retail (e.g., furniture), banking (e.g., mortgages), and government (e.g., property taxes). Like a cockroach, the consumer is tough to exterminate. Consumer spending accounts for roughly 70% of the economy’s goods and services, and as you can see from the chart above, people are still shopping – despite domestic and international challenges. The net result of all these trends is that the economic picture continues to improve and consumers and investors alike are beginning to feel better about themselves. And how could they not? As evidenced by the chart below, household net worth has reached a record level of about $66 trillion dollars, thanks to rallies in the stock market and home process, combined with a renewed conviction of keeping debt in check. Question #1: What is going on in Cyprus? As it relates to this tiny island, approximately the size of Puerto Rico (east of Greece and south of Turkey), the first thing I learned is that the Cyprus situation is another example of a country’s financial sector gone wild. By some estimates the size of Cypriot bank deposits were more than 4x’s the size of its GDP. A key driving force behind the oversized banking industry is Russian depositors, who make up about 1/3 of overall Cypriot banking deposits. Cyprus acted as a sort of Cayman Islands in the Mediterranean for these wealthy Russians, who moved billions of dollars to the island after the Soviet Union broke apart in the early 1990s. The main attraction for the Russians were the lax banking laws and generous tax advantages. In order to clean up this financial mess, the so-called adults or Troika, made up of the European Central Bank (ECB), International Monetary Fund (IMF), and European Commission (EU legislative body), approved a $13 billion bailout for Cyprus on the condition they restructured their main banks (Laiki Bank to be merged into Bank of Cyprus). The end result is that Cyprus (like Greece) chose to take the harsh medicine and stay in the eurozone by combining/closing banks and instituting significant losses on those depositors with more than $130,000 in their accounts (with some depositors expected to lose -60% of their money). Question #2: Should I care? The short answer is “No”. With a population of about 850,000 people, Cyprus is home to about the same number of folks who live in Birmingham, Alabama. Moreover, the size of Cyprus’ economy is barely 0.2% of euro-land GDP. 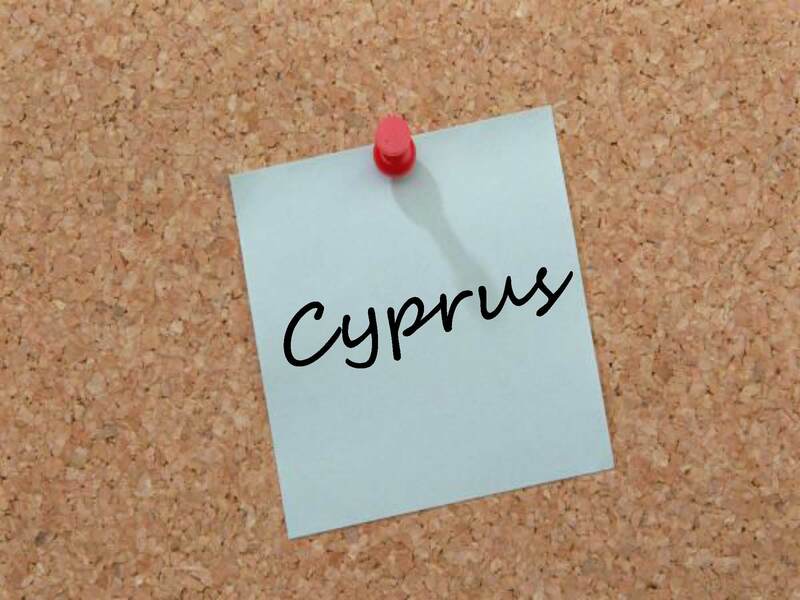 Many pessimistic bears acknowledge the infinitesimal size of the Cypriot economy, but position the country as the domino about to topple the rest of Europe, including the much more important countries of Spain and Italy. The fact that private depositors are feeling a larger brunt of the pain rather than public taxpayers is actually a healthy long-term trend that will force more responsible behavior by other European financial institutions outside Cyprus. as our stock markets set new record highs and our economy gains momentum. Today may be April Fool’s Day, but don’t become bamboozled by silly diversions, this stock market is no joke. DISCLOSURE: Sidoxia Capital Management (SCM) and some of its clients hold positions in certain exchange traded funds (ETFs), but at the time of publishing SCM had no direct position in any security referenced in this article. No information accessed through the Investing Caffeine (IC) website constitutes investment, financial, legal, tax or other advice nor is to be relied on in making an investment or other decision. Please read disclosure language on IC Contact page.